Earlier last year I fell in love with sundried tomatoes. The concentrated, rich, oily flavour packs a punch unlike any other tomato product. Perfect with pasta, on toasted bread, or on some strong cheese – perhaps my favourite use of sundried tomatoes is in this dish. While the tomatoes provide the flavour, the pine nuts offer an important textural element with their soft crunch. Topped with feta, it’s a fantastic vegetarian main that even the most ardent carnivore will enjoy. Heat 2 or 3 tablespoons of oil in a deep, wide based pan. Add the onion and fry gently over a medium heat with a sprinkling of salt for a few minutes. Don’t rush this, let them get nice and soft. Keep the lid on, only removing to gently move them around. Add the risotto rice and ensure each grain is coated in oil (you may need to add a splash more). Stir, frying gently until the grains are turning translucent. Pour in a glass or two of white wine (skip if not using) and stir through until it is absorbed. Slice a few sundried tomatoes, then add them and the pine nuts to the dish along with a few teaspoons of your herbs of choice. Make a jug of vegetable stock and begin adding to the rice about 1/2 mug full at a time, stirring constantly until absorbed. Continue until the rice is cooked al dente (soft apart from a SLIGHTLY firm core). Stir through sundried tomato paste, starting with around 2-3 tbsp. Grate in around 1/2 mug of parmesan at this point. From here, taste and adjust with more tomato paste/parmesan until you have the desired flavour. The cheese is salty, the paste is rich. You want to make the balance to your liking – it may need a splash of vinegar or a sprinkling of salt to achieve the desired flavour. Serve with some crumbled feta. This dish really speaks for itself – no accompaniments needed, just the gorgeous flavour and perhaps a fresh leaf to give it that tomato feel. 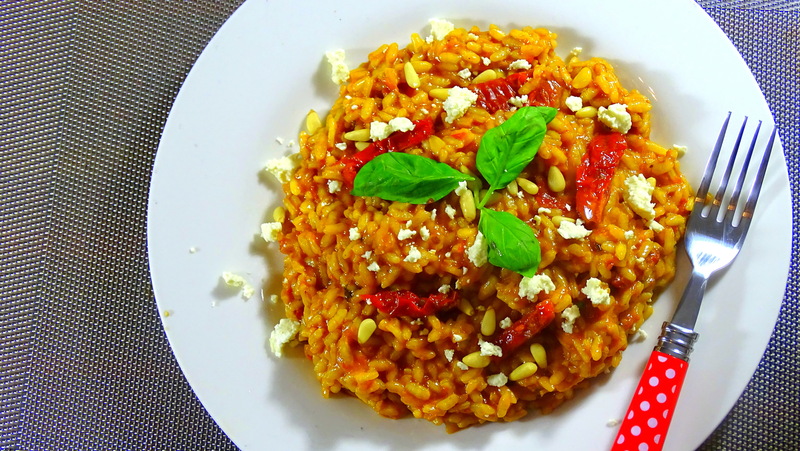 Posted in Guesscipes, One Pot, VegetarianTagged cheese, cooking, food, fresh, guesscipe, healthy, home made, italian food, one pot, Recents, recipe, Rice, risotto, sundried, tomato, vegetableBookmark the permalink.